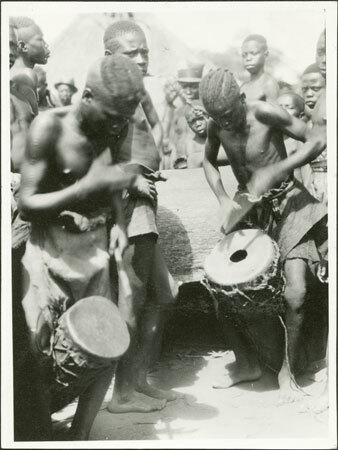 Two youths playing skin drums (gaza), with a wooden gong (gugu) behind, at Prince Rikita's court. A child in the background holds the gong beater, which is also a symbolic ceremonial staff of office for the master of the feast (see 1998.341.460). Evans-Pritchard also identifies an individual in the background (most likely wearing the straw hat) as Babu. Notes on print/mount - "AIII/10 96 EPA 507 Beating drums at Rikita's Babu in background"
Notes on card mount m/s pencil - "SS upper LHS & lower LHS + RCS? marks "Beating drums at Rikitas Babu in background 8.89"
Morton, Chris. "Zande youths drumming" Southern Sudan Project (in development). 03 Jan. 2006. Pitt Rivers Museum. <http://southernsudan.prm.ox.ac.uk/details/1998.341.507.2/>.